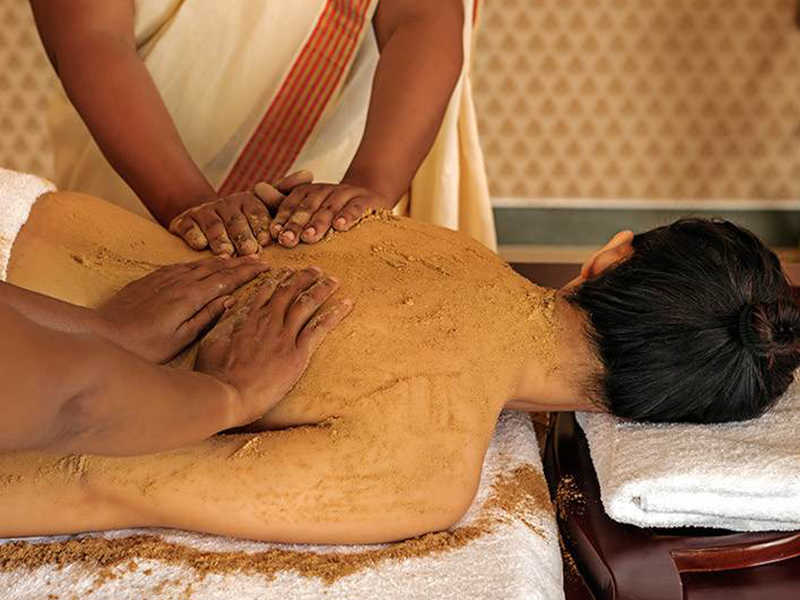 Mekosha Ayurveda Spasuites Retreat, Trivandrum, Kerala - Kerala, India | Costs, Consultation, Treatments, Doctors. 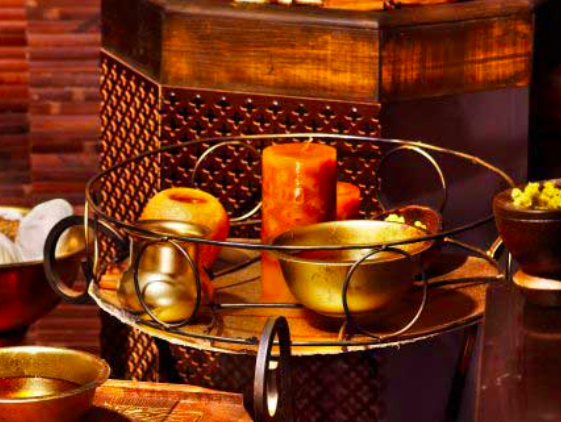 Mekosha is proud to be India’s first Luxury Ayurveda Resort & Retreat offering a Bespoke Wellness Regime, All-Inclusive Wellness Experience right from the comfort of your Spasuite’s In-Suite Treatment Area. Our Ayurveda Resort & Retreat in Kerala guarantees transformation while staying in one of our 11 spasuites, with gourmet Ayurveda-inspired meals, doctors that give you personalized care and attention, yoga/ meditation classes, nature walks & excursions. Beauty is the most obvious external manifestation of our overall well-being. Beauty is more than skin-deep according to Ayurveda. It is the most obvious external manifestation of your overall well being. This beauty care package is so designed to detoxify, recover complexion, improve circulation, regulate the discharge of waste materials, restore skin tone and revitalize your inner spirit. Apart from herbs and herbal remedies a wide variety fresh fruits, flowers leave etc are also used in our program and you get purified through treatments like Abyangam, Udwarthana, Lepam, Ksheeradhara, Njavarakihi, Nasyam, Netrasekam, herbal facial, medicated steam bath etc. Life style disorders like hypertension, thyroid disorders etc can be prevented to a great extent. If panchkarma like vamana , virechana are practiced according to the change in season among the group that are prove these diseases.Thus panchkarma if practiced scientifically as laid down in shastra can definitely be a solutions to many issues suffered by the masses. Both curative as well as preventive aspects need to be explored. Ayurveda treatment can perhaps help to prevent and treat certain types of cancer, including breast, lung, and colon cancer. Ayurvedic remedies can be helpful for prophylactic, palliative, curative and supportive treatment of cancer. The pain and complications of cancer and its treatment can be ameliorated by making use of Ayurvedic principles. Ayurvedic medicines can help to minimize the adverse effects of chemotherapy and radiotherapy. Ayurvedic treatment for cancer can be used an adjuvant or a co-therapy along with chemotherapy or radiotherapy and even for post-surgery care. The Ayurvedic medicines can reduce the therapeutic dose of the various chemotherapeutic drugs. In patients in whom chemotherapy, radiotherapy or surgery is contra-indicated, Ayurvedic medicines can slow the progress of cancer. Ayurvedic medicines can comfort and improve the quality of life of people with cancer. We offer graceful, elegant, yet understated luxury that’s in a category of its own in our 11-suites only boutique luxury Ayurveda resort. 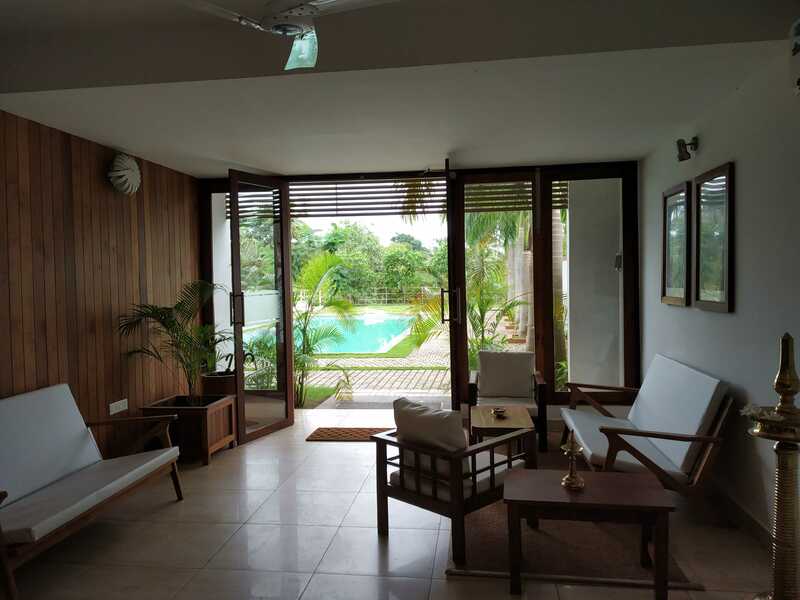 The property is 45 minutes away from Trivandrum airport in Kerala, tucked away in a private, serene location along the river. All our suites are a spacious 600 sq ft and filled with light, each with an integral, private in-suite spa, a personal library of books & a balcony overlooking the pool and river. 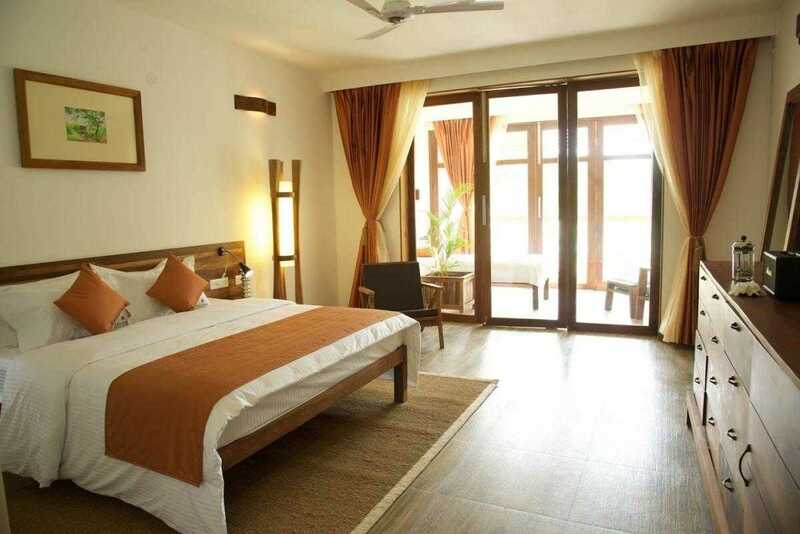 Sleek and contemporarily designed, the suites are fitted with luxurious king sized beds using superior cotton bedding. Fresh fruit, bottled mineral water and a selection of herbal teas are always available. Medicated oil is first applied to the head and body. This is followed by herbal pastes and medicinal herbs applied to the head and covered with green plantain leaf. The paste is then removed and the oil wiped off. Sirolepa improves vision, cures headaches and insomnia and is used in the treatment of stress, anxiety and depression. 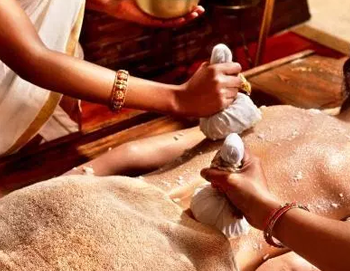 This treatment is a contribution from Kerala to Ayurveda and involves fomentation of the body with boluses of a speciality rice known for its medicinal and nourishment value. It is cooked in milk along with a suitable herbal decoction and is very effective for rejuvenation and nourishment. It strengthens tissues, reduces pain and inflammation and is recommended for low back pain, neck pain, rheumatism, arthritis and neuromuscular disorders. Medicinal poultices warmed in herbal oil are used to cause sweating in either the whole body or specific parts of the body. This is a very effective treatment for reducing heaviness of the body and limbs and also for obesity generally. Bathing the back of neck using warm medicated oil or herbal decoction, this is a rejuvenation therapy for neck pain, shoulder pain and stiffness. Greeva Vasthti is likely to alleviate most types of problems related to the neck. Advised for patients who suffer from frozen shoulder, cervical spondylosis, headache, giddiness and osteoporosis. A treatment process by which part of the body or whole body is perspired by application of njavara rice pudding. Helps in improving the skin texture and muscle tone. Advised conditions of muscular dystrophy and stiffness. A special treatment in which warm medicated oil is retained over the knee joint. It relieves pain and stiffness and eases movement of the knee joint. It also strengthens the joint, muscles and soft tissues and improves circulation. This treatment is advised for knee joint conditions including arthritis, degenerative conditions, tendon injuries and sprains. An effective treatment for asthma Uro Basthi, or Hridaya Basthi, is retention of medicated oil on the chest wall. It is also recommended for other respiratory problems such as bronchiectasis and muscular chest pain around the sternum and also strengthening of the heart. 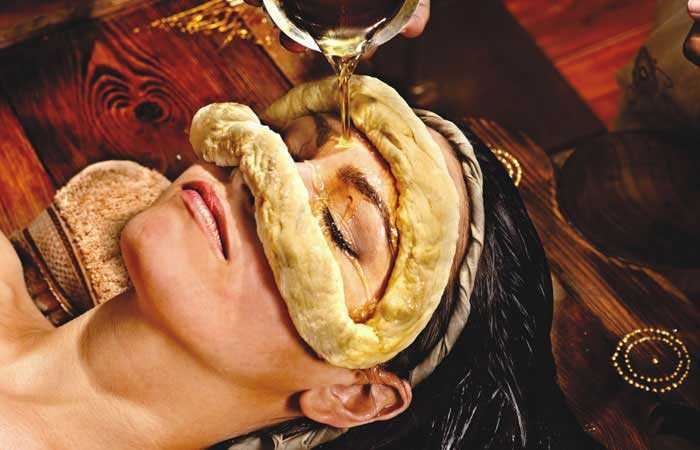 Medicated decoction and ghee are retained around the eyes within a border made of medicated herbal dough in order to provide optimum rejuvenation to the eyes. This treatment strengthens the optical nerves, prevents cataracts and gives a cooling effect to the eyes, resulting in improved vision and strengthening of the eye tissues. It is recommended for burning in the eyes, dryness of the eyes, watering eyes, curved eyes, conjunctivitis and myopia. Hydrotherapy is a time-honored technique that uses water by varying temperature and pressure to stimulate healing and to cleanse toxins. There are many different types of hydrotherapies practiced at Carnoustie including saunas, colonics and simple hot and cold showers. Hydrotherapy increases the circulation of blood and lymph, which increases waste elimination and replenishment of nutrients. It helps in flushing out the toxins and increasing oxygen in the body. Alternating temperatures for example, using the cold plunge after the sauna or steam room mechanically squeezes the toxins out of the body, bringing in vital nutrients and oxygen. Using hydrotherapy in a number of ways can increase the circulation and clearance of our main organs of detoxification: the skin, kidneys, colon, lymphatic system and liver. Acupressure is based on the concept that life energy flows through ‘meridians’ in the body and that clearing blockages in these meridians with physical pressure can help clear the accumulated toxins from the body and restore the ability of our organs to function optimally. Acupressure is a good supplementary treatment to regulate and tone the liver and the kidneys (major detoxifying organs). It stimulates elimination and release of toxins through the bowels, improves the digestive system, relieves general fatigue and confusion and helps fortify the immune system. Pranic healing is a simple yet powerful and effective system of ‘no-touch’ energy healing. Pranic healing focuses on cleansing and energizing. Cleansing means removal of the diseased energy from the health aura and energizing means adding ‘prana’ or life energy to the affected area. It is based on the fundamental principles that the body is a self-repairing living entity that possesses the ability to heal itself and that the healing process is accelerated by increasing this life force that is readily available from the sun, air and ground within the recipient's body to address physical and emotional imbalances. Experts focus on cleansing the Aura to achieve inner stillness and calm in those who are suffering from acute mental stress and depression. Reiki is a healing technique based on the principle that the therapist can channel energy into the patient by means of touch to activate the natural healing processes of the patient's body and restore physical and emotional well-being. One of the greatest healing health benefits of this therapy is stress reduction and relaxation. The process aids in the repair of body tissues, removes toxins and impurities and restores balance and health by cleansing the body. Reiki is a specific type of subtle energy process in which healing is performed by the touch of the hands, allowing the flow of the energy from a limitless source (God Force) to the patient via the Reiki practitioner. It is extremely powerful, wherein energy can be channeled by intention alone. 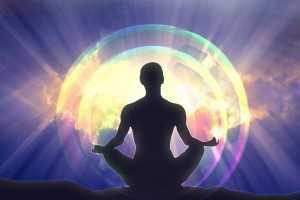 Reiki is excellent for healing any physical, mental, emotional and spiritual issues of any kind. Reflexology, or zone therapy, is an alternative medicine involving the physical act of applying pressure to the feet, hands, or ears with specific thumb and finger. 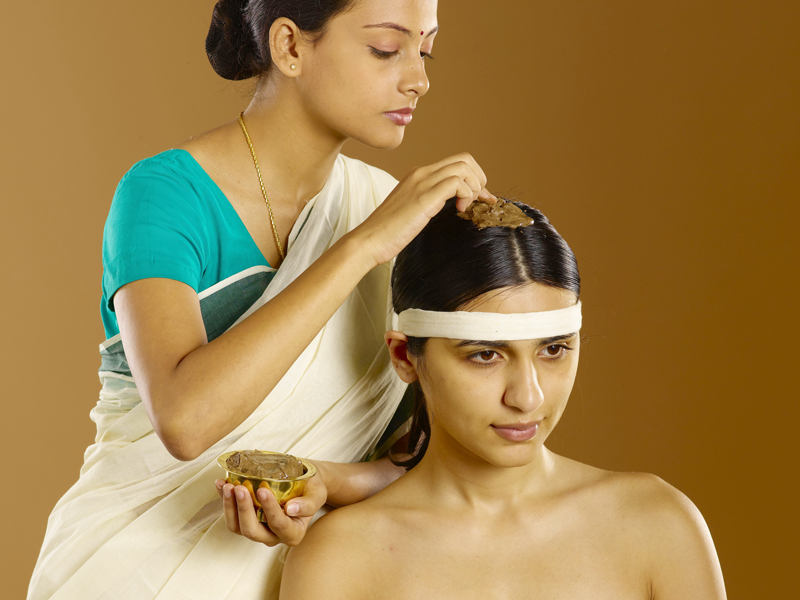 Thalam is one of the oldest and most popular Ayurvedic treatments for mental abnormalities and neurotic disorders. In this treatment a mixture of medicated oils and herbs is poured into a sealed funneled cap like mechanism and allowed to hold for a specific period of time (20-40 mins) to allow the mixture to be partially absorbed by the scalp. The treatment is known to nourish and rejuvenate the scalp and the brain cells and prevents and cures brain damage. 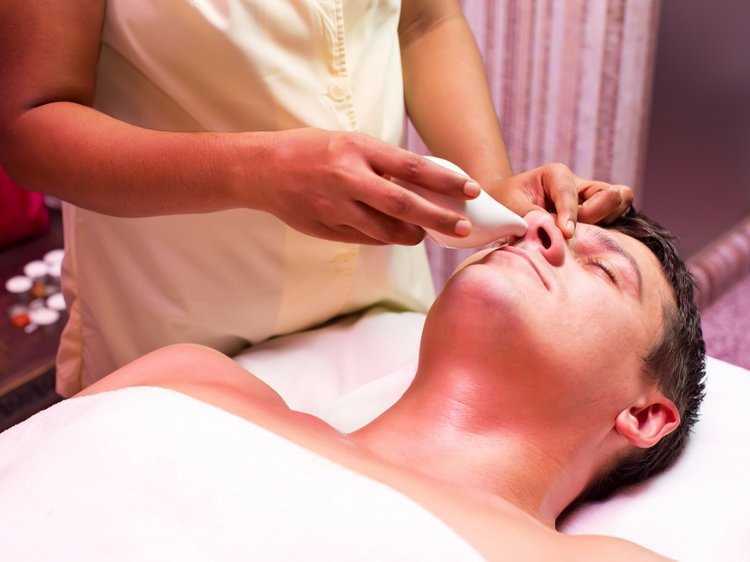 This treatment soothes the ear, nose and throat passages as well as combats mental tension and headaches. It is very effective in curing anxiety disorder, insomnia, migraine, chronic depression and mental stress. It improves memory and concentration. 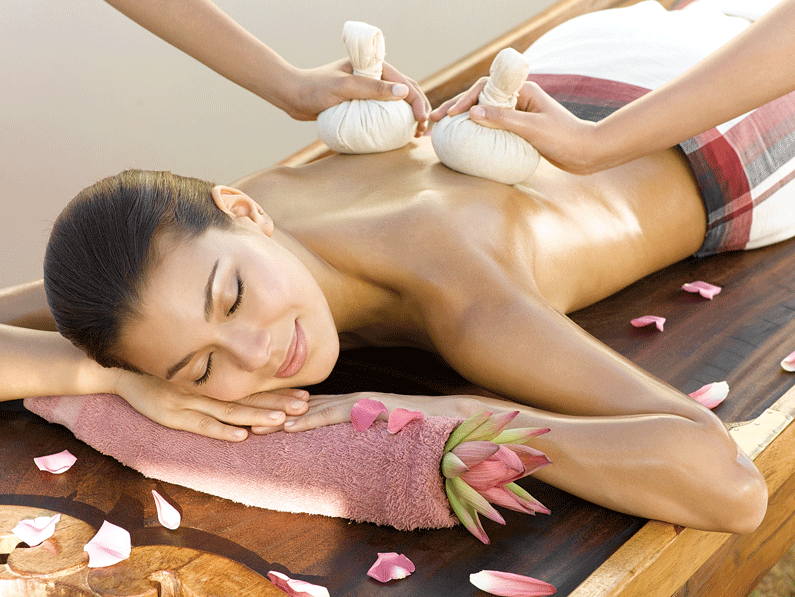 Udwarthanam is a special dry therapeutic deep tissue massage using herbal powders. The massage uses vigorous upward strokes rubbing the herbal powders on the body with bearable force. The procedure is performed in seven postures. The massage exfoliates the skin, breaks up fatty deposits and energises blood circulation. After completion the person is advised to take rest for 30 minutes, followed by a shower with warm water. The treatment reduces the excess fat accumulated in the subcutaneous tissues, strengthens and tones up the muscles, improves circulation, opens up the body channels (srotus) and releases the toxins. Its principal objective is to increase the metabolic rate, remove cellulite and help in weight reduction. Gharshana literally means ‘to rub’. Udgarshanam is a dry brushing massage using raw silk gloves that shrinks fat cells, increases circulation and improves lymphatic drainage. It is a traditional Ayurvedic dry massage that refreshes and stimulates the skin and lymphatic system, enhancing blood circulation and the release of accumulated toxins. The massage ends with a few cycles of alternative showers with hot and cold water. This further stimulates the blood circulation and rejuvenates the skin. It enhances vitality through improved metabolism. This treatment is specifically designed for weight loss, cellulite and water retention. The word Sweda is derived from Sanskrit swid, meaning 'to sweat or to perspire'. 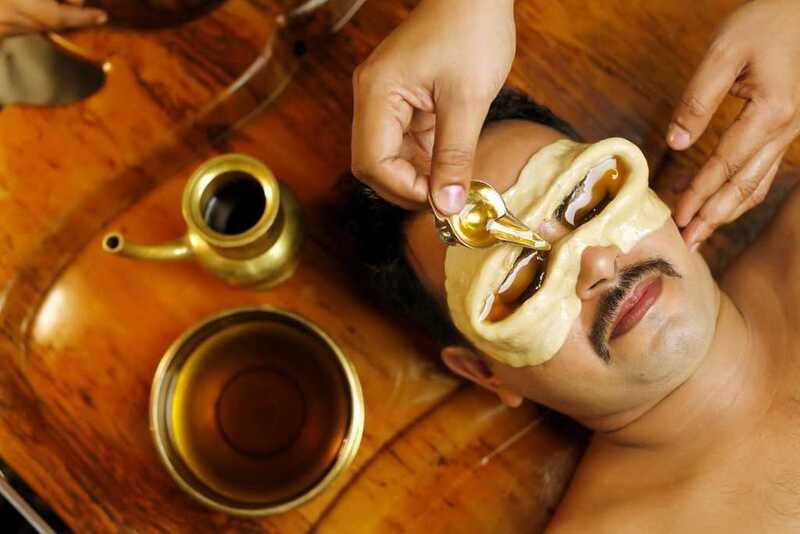 Swedana is a practice of inducing sweat with the help of steam generated from medicated herbal decoctions. The fomentation is done by making the person to sit in a chamber or wooden box where steam emanates from boiling herbal decoction. Sweating opens the pores and rids the body of all impurities through the sweat glands. It thaws the doshas and clears the obstruction of channels of circulation, thus facilitating easy expulsion of faulty doshas. 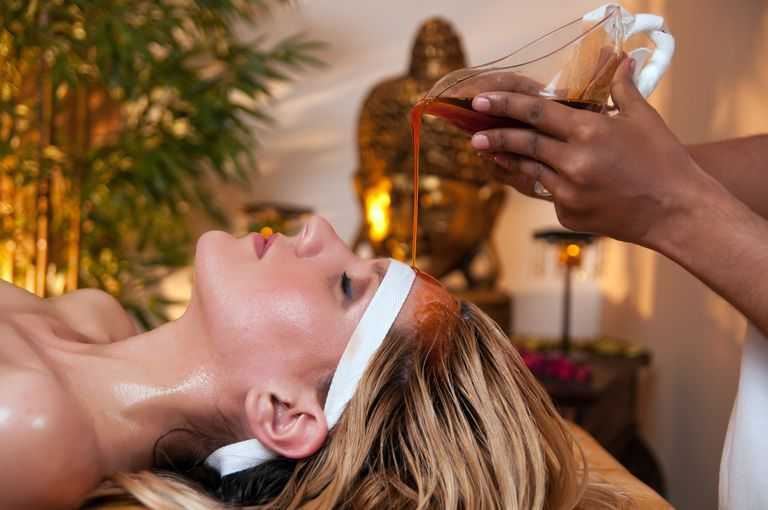 Ayurvedic fomentation is usually given after an oil massage. The treatment balances Vata and Kapha humors in the body, improves digestion, acts on fat deposits, relaxes sore muscles and relieves stress. 'Dhara' means a continuous and constant stream of liquid. Dhanyamla is a special type of treatment, derived from the word meaning cereal (dhanya) and vinegar (amla). Dhanyamla is a specially fermented medicinal mixture of oryza sativa, citrus rotundus, flattend oryza sativa, zingerver officianalis among other special ingredients. This warm mixture is poured over the body in a continuous strain. 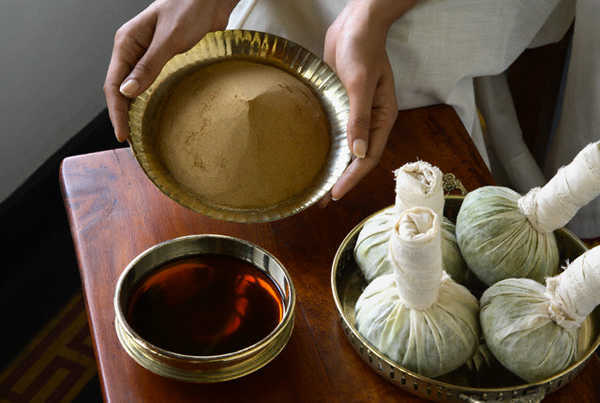 Dhanyamla is kept lukewarm during the full course of the treatment procedure. The therapy is very effective in kapha-vata predominant conditions. It helps in combating obesity, reduces cholesterol, inflammations and muscular pain and activates nerves. 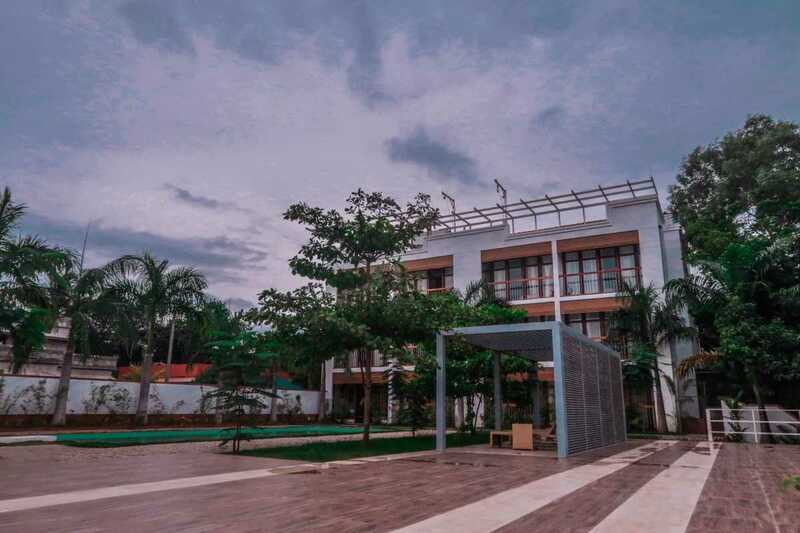 Meant for all, the treatment includes series of bonafide Ayurvedic therapies to heal your doshas so as to regain the perfect well-being and body equation. Lauded as the most compelling natural and preventive way of medicine, the treatment will aid you escape unforeseen ailments, while rejuvenating and restoring the natural health and body, and enhancing longevity. A complete curative conditioning procedure will be undergone and various other curative therapies will be experienced that will be directed towards making the body constructive, formative, tenacious and agile. In Ayurveda, this condition can be correlated to Dushta Pratishyaya, where the main dosha affected is Kapha. It get aggravated and vitiates the Prana Vata (a sub type of Vata), which is mainly present in the respiratory tract. The Ayurvedic approach to sinusitis treatment is multifaceted and can involve a combination detoxification processes through Panchakarma, oral medicines, dietary and life style modifications. Therapies like Nasyam, Lepanam, Thalam, Vamanam, Shirodhara are commonly practiced depending on the dosha predominance and severity. 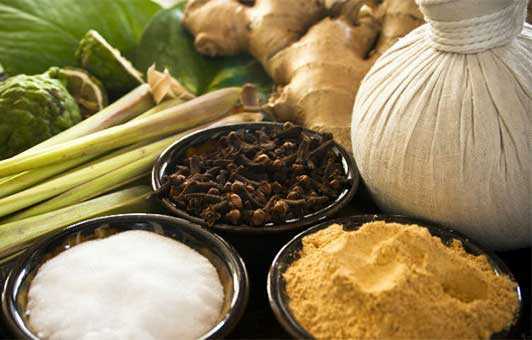 Nasya Karma or Nasyam is a unique and one of the five detoxification therapies mentioned in Ayurveda, highly successful in treating Sinusitis. It is a process in which medicated oil or powder or fresh juice is administered through the nostrils to clear the Kapha accumulated. Recurrence can also be prevented. The treatments used are Netra Tarpana, a rejuvenating treatment for sore eyes using warm ghee; Netra Dhara, a natural way of cleansing the eyes using medicated oils and Netra Lepam relieves various types of eye pain. Treatments like Netra Bandhana, Thulum, Netra Putapaka and Netra Pindi in combination with eye exercises like sunning, palming, eye wash, candle light reading, Snellen chart reading, ball exercises, steaming and application of cold pack relaxes all the muscles of eyes, increases blood circulation to the eyes and softens and maintains the shape of the eyeballs. Ayurveda calls this disease Kasroga and considers it to be caused by poor digestion. Poor diet, poor digestion and incomplete elimination of wastes lead to formation of ama (mucus) in the lungs. This creates a favorable ground for growth of infecting organisms in the bronchial area. Stress, poor lifestyle, bad circulation, and lack of rejuvenative measures can deteriorate the body’s immune response to invading organisms in the bronchial area. The Ayurvedic treatment of Bronchitis is aimed at simultaneously correcting lung and stomach functions. Herbs are given to ease troubled breathing and expel phlegm. At the same time, Ayurvedic digestive formulas are prescribed to enhance the digestive fire in order to kill pathogens. Ayurveda can prove to be a very curative approach in Neurological disorders as it helps in maintaining a healthy balance for the brain. 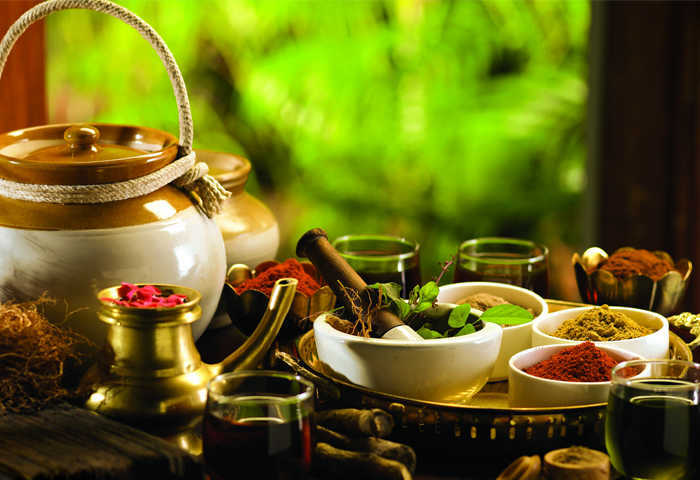 Ayurvedic remedies are primarily focused upon studying the basic behaviour of the disease. Neurological disorders are a result of imbalance caused by an imbalanced vata and influence your brain, spine and central nervous system. The nervous disorders can influence either a single neuron or can affect the whole pathway. 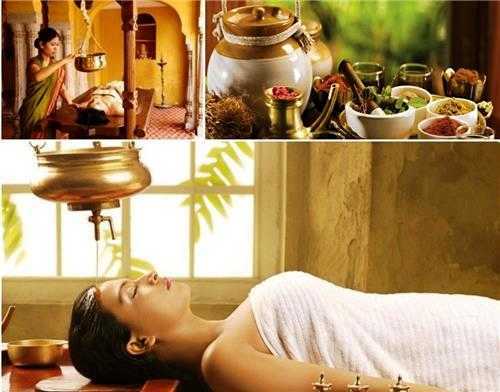 Through internal medicines and therapeutic ayurvedia such as Shirodhara, Sirovasti, Nasyam, Pizhichil and Pichu, equilibrium between the doshas is brought back. 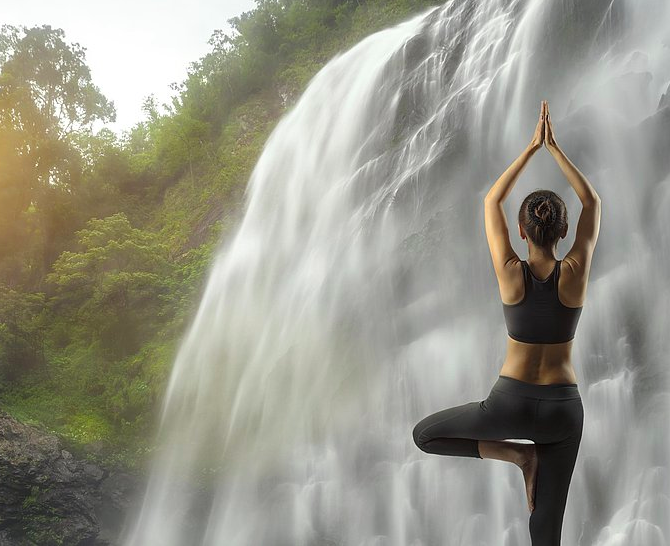 Yoga and meditation further help nervous system to revitalise and heal. The treatment differs for every patient depending on their problems. In Ayurveda, this condition is known as Griva Sandhigata Vata. As the name suggests, the problem is caused by the vitiation of Vata dosha (biohumor associated with Air and Ether). When Vata gets aggravated it causes the depletion of the body’s tissues. The cold and drying qualities of Vata dosha lead to the decrease of the cushioning fluid and connective tissue between the joints that are ruled by Kapha dosha (biohumor associated with Earth and Water). In time, it leads to disc degeneration and eventually brings about spondylosis. Any external massage is not of much use. Violent massage with deep pressure is very harmful for the patient. Only gentle massage over the muscles of the neck and shoulder joints should be applied and for this purpose Mahanarayana taila is best suited. This gentle massage can be given 2-3 times a day. In winter season; this medicated oil should be gently warmed before application. Healthy, flexible joints rely on strong digestion and metabolism. Poor eating habits, weak digestion and stress can allow impurities to accumulate, and build up in the joints. This inhibits joint function, mobility, and comfort. Deep cleansing of the joints and tissues helps relieve immediate symptoms of arthritis. The key to preventing a future build-up of impurities is to create a healthier metabolic system — one that can easily and efficiently eliminate harmful toxins from the body. The raw material for building healthy joints and bones is nutrient plasma. Plasma flows throughout the body — like the sap in a tree — delivering vital nutrients to cells. The body uses these nutrients to build tissues, including joint tissue. Ayurveda categorized Slip disc as one of diseases caused by vitiation Vata (one of the principle dosha in the body, responsible for the movement and functionality of the body). Treatment in Ayurveda is aimed at restoring the equilibrium through correction of the underlying functional in-equilibrium. 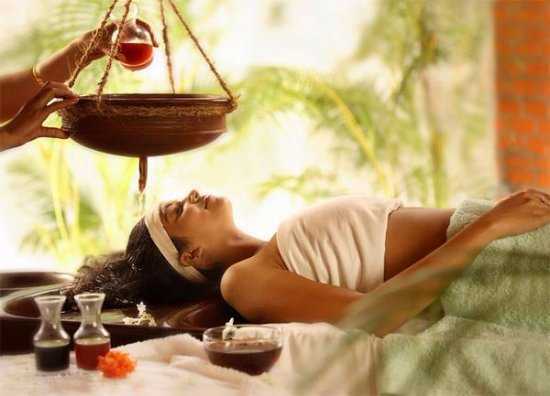 Ayurvedic treatments for Slip disc concentrate on bringing back the aggravated vata to the state of equilibrium and thereby to the state of health. 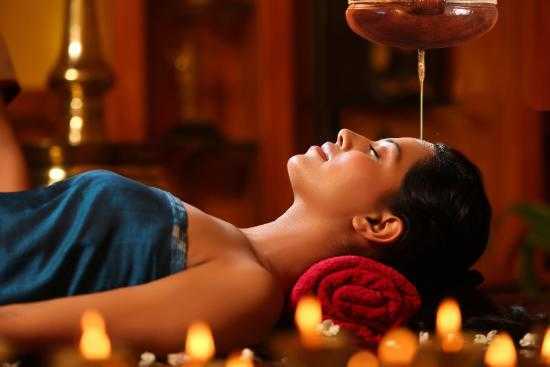 The therapies like Abyanga swedam, Nasyam, Pathrapotala swedam, Choornapinda swedam, Pizhichil, Shirodhara, Kadeevasthy, Greevavasthy, Navarakizhi, Vasti etc. are done as per the necessity and condition. These therapies are directed towards relieving the inflammatory changes, releasing the spasms and nerve compressions in the affected area, strengthening the supportive tissues holding the spine, nourishing the joints through improving the circulation. Usually the treatment period is 4 – 5 weeks according to the severity of the disease. According to Ayurveda, the skin has six layers, found externally as well as stretching out to the more profound levels of the body. A skin disease is established profoundly into different tissues, such as fat, muscles, blood and so forth. Ayurveda dependably tries to find the disease by treating it, particularly as indicated by its cause. The disease being deep seated, it is hard to alter the issue rapidly. 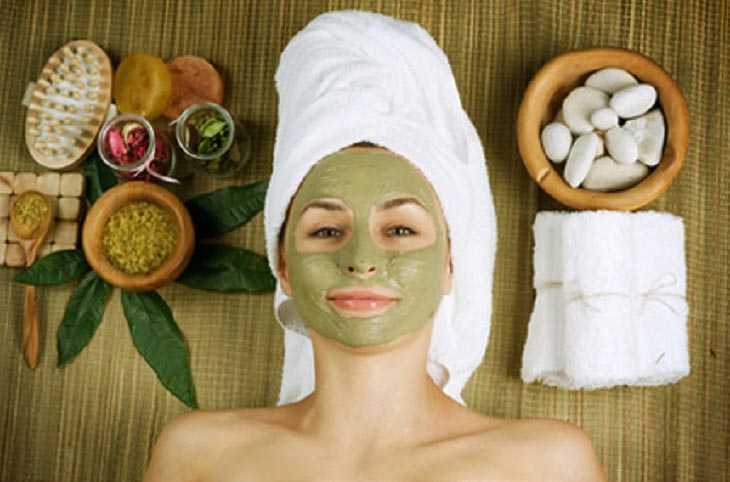 Ayurvedic skin treatments may take a couple of weeks to remove the indications. Balancing vitiated Vata is the best way to treat chronic backache. 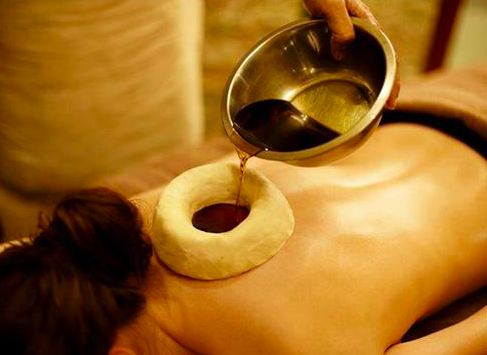 One of the best Ayurvedic treatments for back pain is Kati Basti (Back oil dough therapy). 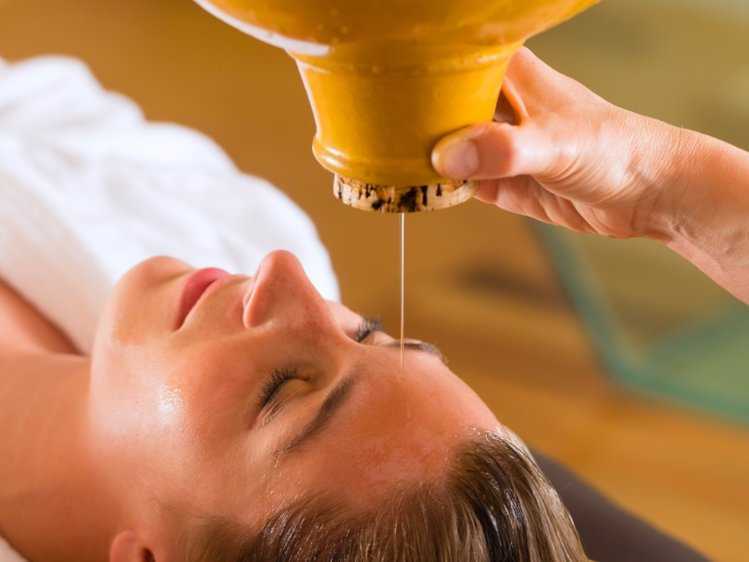 It is a form of external oleation (Snehana) therapy in Ayurveda. 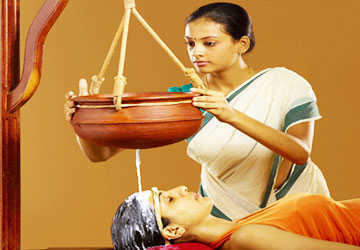 For this ayurveda spine treatment, the patient is made to lie face down. A “dam” made with gram flour dough of four to five inches in diameter is created on the patient’s back (lumbar-sacral area). Medicated oil is poured into this dough ring. When cool, the oil is soaked up using cotton gauze and the process is repeated several times. After delivery, a woman becomes feeble, also empty bodied due to physical and mental stress, and suffers debility related to reproductive organs. The ayurvedic procedure that will be take place only under the supervision of Ayurvedic experts at the centre, would heal you up and aid in restoring your pelvic structure, prop up healthy lactation, reduce your stress, relieve you from neck and back ache. Abhyangam, a complete body massage, will as well be practiced regularly with curative and therapeutic oils to relax your body, revitalise it and enhance immunity. The oils used will vary as per your body constitution and the need. The terms Paksaghata, Paksha Vadha and Ekanga Vata have been used to describe Paralysis in Ayurveda. 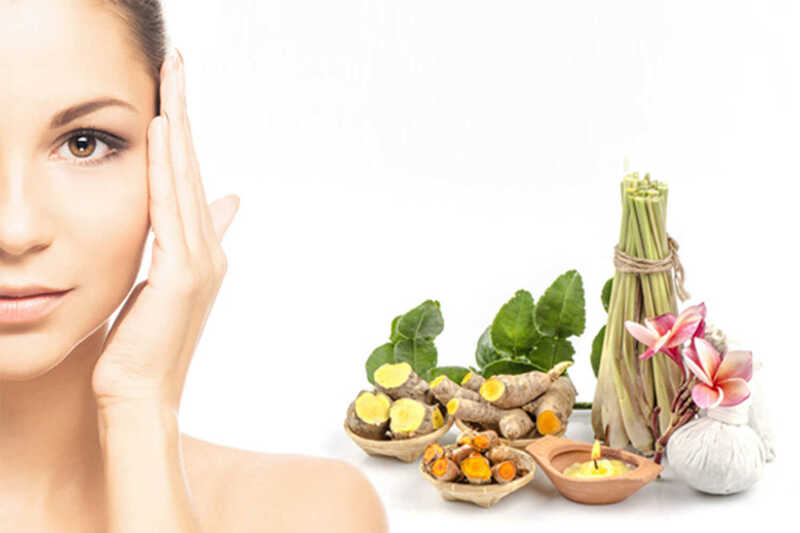 Ayurveda has mentioned facial paralysis as a separate disease entity called “Ardita vata”. The treatment guidelines for these conditions have been widely enumerated in the classical texts of Ayurveda. In spite of the various treatment modalities available, Ayurveda has proved or stands to be one of the most effective treatment methodologies for the best possible recovery in Paralysis condition. The therapies like Abhyanga swedam, Nasyam, Karna pooranam, Snehapanam, Virechanam, Shiro vasti, Sarvanga dhara (Pizhichil), Pichu, Navarakizhi, Vasti etc. are done as per the necessity and condition for about 4 – 5 weeks. Apart from these Diet & Life style modifications are essential throughout the treatment of Paralysis. Psoriasis is believed to occur due to vitiation of all the three doshas (Vata, Pitta, Kapha) in varying degree, but predominantly Vata and Kapha according to the Ayurvedic concept. Shodhana chikitsa (Detoxification) done through Panchakarma therapies like Vamana, Virechana, Rakta mokshna etc & an exclusive therapy called Thakra dhara. 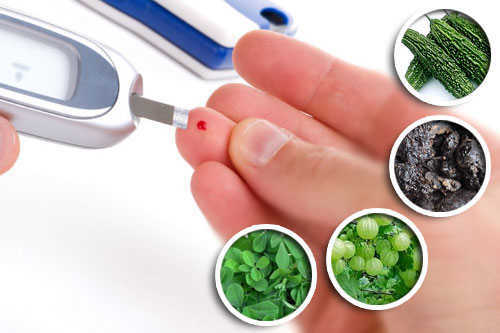 Ayurveda does not regard Diabetes as a disease that can be treated by mere medicine or by a dietary regimen. Madhumeha is classified as a Maha Rog (Major Disease) because, if not treated in time, it can lead to several complications in the body, including eye problems, joint pains, impotency, kidney failure, sexual and urologic problems, and more. Diabetes is a metabolic disorder and it cannot be merely treated by controlling sugar levels. The treatment recommended in Ayurveda – as against modern medicine – is aimed at rejuvenating the body to not only balance sugar levels, but also ensuring that no further complication is caused. 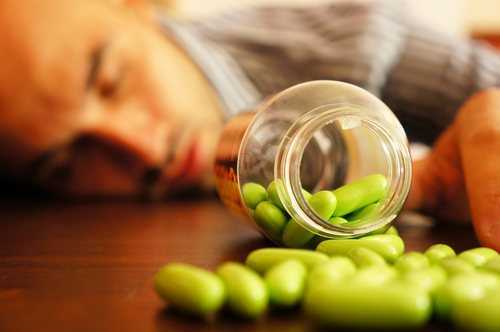 Ayurveda by its age-old remedial treatments and medicines would help you overcome from alcohol and tobacco abuse. The detoxification and rehabilitation program includes de-addiction therapies- herbal oil massages, Dhara, Njavarakizhi, Thailam, herbal steam bath, internal medicines which would detoxify your body holistically and will aid in regaining the balance.